Field Sites The team moved farmed oysters from relatively low salinity sites in Chesapeake Bay (the Coan River, the York River, and Nassawadox Creek) to Little Machipongo Inlet on the seaside of Virginia’s Eastern Shore, where waters are close to full ocean salinity. Background image courtesy of Google Earth. 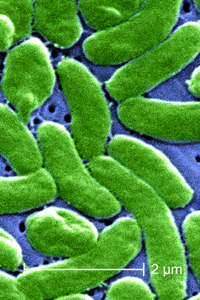 Vibrio vulnificus This scanning electron micrograph (SEM) depicts a grouping of Vibrio vulnificus bacteria; Mag. 13,184 X. Image courtesy CDC. Experiment One The “most probable number” (MPN) of Vibrio vulnificus bacteria drops sharply upon exposure to salty water. Results from experiment that begain in mid-August, 2011. Red shows oysters from Coan River; green from York River; and yellow from Nassawadox Creek at 0, 7, and 14 days after transfer to salty water. Note the sharp drop in V. vulnificus in all cases. Experiment Two The “most probable number” (MPN) of Vibrio vulnificus bacteria drops sharply upon exposure to salty water. Results from experiment that begain in mid-September, 2011.Red shows oysters from Coan River; green from York River; and yellow from Nassawadox Creek at 0, 7, and 14 days after transfer to salty water. Note the sharp drop in V. vulnificus in all cases. The Food and Drug Administration’s regulatory change, set to take affect during this year’s harvest season in the Gulf of Mexico, requires Gulf shellfish growers to eliminate the bacterium Vibrio vulnificus from shellfish through the use “post-harvest processing” or “PHP.” PHP methods include low-temperature pasteurization, flash freezing, high pressure, and low-dose irradiation. The Gulf is the nation’s leading source of oysters, supplying 70% of nationwide demand, including up to 50% of the oysters processed by local shucking houses. Some members of the Virginia and Gulf aquaculture industries counter that existing PHP methods are too costly for an industry dominated by small, local operators; change the texture and taste that oyster lovers crave; and would duplicate existing oyster-sanitation rules. They also note that infections from Vibrio vulnificus account for only 0.3% of deaths attributed to food-borne illnesses, and argue that the FDA should focus on reducing deaths from Salmonella and Listeria instead. During their study—funded by Virginia Sea Grant’s Fishery Resource Grant Program—the team moved farmed oysters from one relatively low- and two moderate-salinity sites in Chesapeake Bay (the Coan River, the York River, and Nassawadox Creek) to Little Machipongo Inlet on the seaside of Virginia’s Eastern Shore, where waters are close to full ocean salinity. They moved about 200 oysters from each site, carrying them by truck in insulated coolers. The team ran two experiments, one beginning in mid-August 2010 and the other in mid-September. 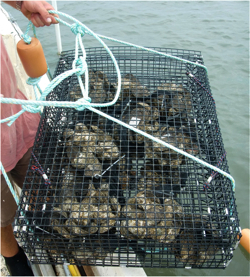 Both dates lie within the FDA’s 2010 “risk season,” which roughly coincides with the adage that raw oysters shouldn’t be consumed in months without an “r.” The team sampled the transplanted oysters upon collection, after one week, and again after two weeks, using molecular diagnostics to measure levels of Vibrio vulnificus in oyster tissues. Their molecular studies, measured by the “most probable number” (MPN) of Vibrio vulnificus bacteria in each sample, shows that exposure to salty water decreased Vibrio vulnificus levels from a high of 750 MPN per gram of meat in pre-transplant oysters (with an average of 160 MPN per gram) to less than 1 MPN per gram. The team also found that the shift from fresher to saltier water has little effect on oyster health, with less than 5% mortality even among the oysters experiencing the largest salinity change. Another important outcome of the study was initial confirmation that a novel part of the team’s research—use of a real-time quantitative polymerase chain reaction (qPCR) assay—worked well to identify Vibrio vulnificus. The team cautions that further study with a larger number of more highly infected oysters is needed to confirm that an oyster relay can effectively bring Vibrio to the level (less than 30 MPN per gram) required by the Interstate Shellfish Sanitation Conference. The ISSC—a partnership of state and federal control agencies, the shellfish industry, and the academic community—sets the sanitation guidelines that regulate the harvesting, processing, and shipping of U.S. shellfish.